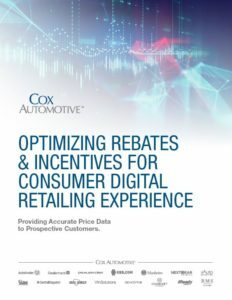 Transform the buying experience with Cox Automotive integrated incentives, the industry’s only source for consistently accurate information for powering software solutions. Create a flexible, customer-friendly car buyer experience — and the deal-centric process that’s unique to your business. Today’s car buyer wants a flexible, transparent process that begins at their convenience and seamlessly connects them to a showroom process that’s fast and friendly. Our integrated incentives are the industry’s only source for consistent data across all advertising, marketing and software channels, giving consumers, dealers and OEMs the confidence for making better, more informed pricing and payment decisions. Display inventory incentives in front of actively engaged shoppers. Anytime. Anywhere. Generate engagement for your brand, drive traffic and connect online to in-store with AdLink and CampaignLink. Start the deal online by matching vehicles, incentives and payment/pricing tools with ListingLink and PaymentLink. Compare any deal scenario (purchase, finance & lease) to get the customer into the right vehicle at the best price or payment with DealLink. Match price and payment options for quicker contracting and customer acceptance with DeskingLink. Drive down customer acquisition costs by serving current customers' replacement vehicle options with EquityLink. Learn how you can tap into integrated incentives today. We're here to help! Learn more about integrating rates and incentives.